It was pretty late when I left for lunch today so I didn't get a chance to check which soba M. had last time at Cocoron that I coveted. I randomly ordered the cold buta shoba soba and it turned out to be precisely what I wanted. 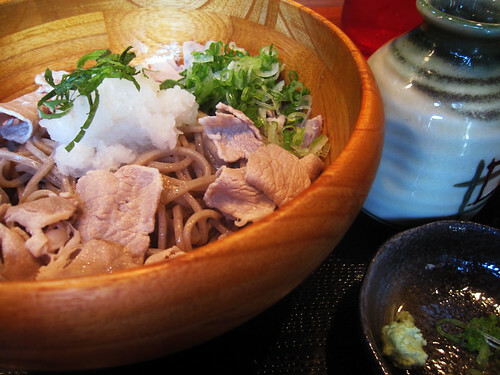 I love this combination of tastes: the bitterness of shaved radish, the slight texture of thinly sliced scallions, barely there pieces of pork, the soy mixture that is poured on top and of course the delicious soba noodle itself. I could have eaten that particular balance of tastes all afternoon long. Instead it ended with some warm water to soup up the dregs of my meal. Perfect.